A first-of-its-kind space rock filled with pristine material from the formation of the Earth itself has returned to the inner solar system, after billions of years in the cosmic boondocks. And it could help us piece together our planet’s origin story. Four and a half billion years ago, chunks of the same material that formed Earth and the other rocky planets are thought to have been flung into the Oort cloud, a ring of icy debris encircling the outermost edge of the solar system. Untouched, they’ve been preserved for eons in the deep freeze of space. Now, astronomers have spotted one of these fossils nearby, marking the very first observation of a rocky object from the Oort cloud. “This is super exciting, because it could be a piece of what formed the Earth” Olivier Hainaut—an astronomer at the European Southern Observatory and co-author on the new Science Advances study describing the discovery—told Gizmodo. The object, dubbed PANSTARRS, was spotted in 2014 by Pan-STARRS1, a Hawaiian telescope used to identify rogue comets and asteroids in our planet’s backyard. The telescope routinely surveys the entire sky and turns up thousands of uninteresting hunks of debris. But as soon as PANSTARRS’ orbit had been calculated, Hainaut and his colleagues realized they had found something exceptional. The shape of the orbit was indicative of a long period comet—an icy body that fell into the inner solar system from the Oort cloud. But as comets from the Oort cloud hurl toward the Sun, they release a long tail of sublimating ice and dust. This one didn’t. Curious, the astronomers decided to take a closer look using the European Southern Observatory’s Very Large Telescope in Chile. And things got even stranger. By studying the faint light reflected off PANSTARRS, Hainaut and his colleagues learned that it is not filled with ice at all, but with rocky material. 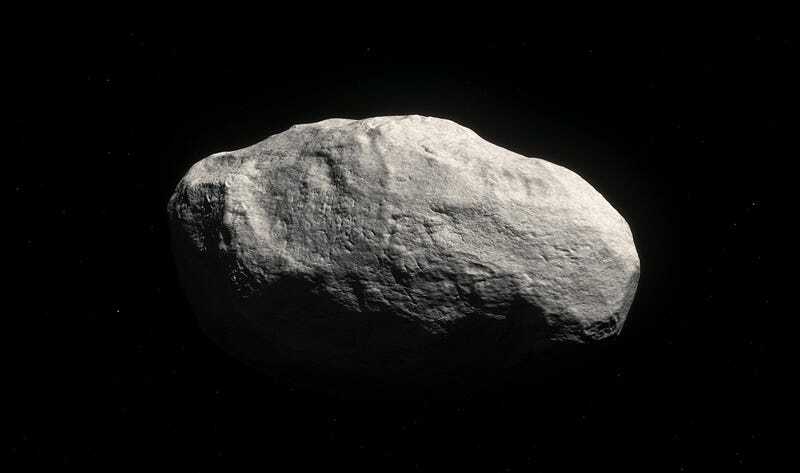 In terms of composition, it’s a classic S-type asteroid, similar to those found main asteroid belt between Mars and Jupiter. Eventually, the astronomers concluded that PANSTARRS was formed in the inner solar system long ago, before being ejected into the Oort cloud as the rocky planets themselves were coalescing. That makes it a potential building block of Earth, Venus, Mercury, or Mars. “This one is the first uncooked asteroid we have found: it has been preserved in the best freezer there is,” lead study author Karen Meech of the University of Hawaii said in a statement. PANSTARRS has already made its closest approach to the Sun, and it’s now on its way back to the outer solar system. But if we get lucky, one of its cousins may whiz even closer to Earth, allowing astronomers to get a detailed look at its composition. This could lend insight into the exact conditions under which our planet was formed. Our history is flying around out there, and if we’re patient enough, we’ll find it.